Here's wishing my dear Mother and all the moms out there, a very lovely Mother's Day! When May rolls in, our hearts draw closer to those that are so dear, those that have nurtured us and inspired us to look within and find ourselves. I want to express my gratitude and appreciation for the creative spirit that my mother ignited in me! 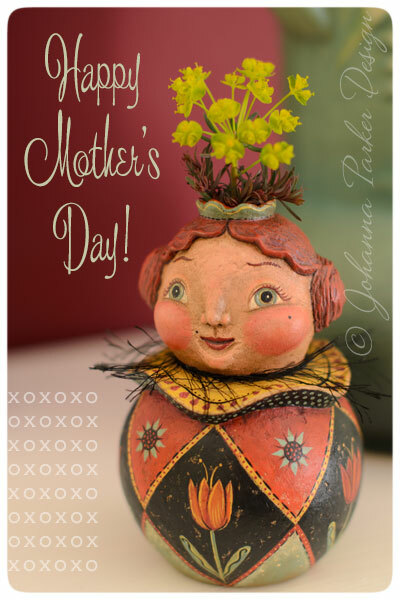 It is a pleasure to create such whimsical folk art on a daily basis, and I know that my mom's artistic touch and encouragement ushered me along this creative path that I do so enjoy. * Pictured above is an original "Flower Keeper" - a new concept debuting in May! These collectible ball characters can be filled with water to keep your delicate bouquets fresh. Stay tuned for my "Flower Power" Web Sale, debuting this coming week on my Folk Art Originals page. Join my Mailing List for more details.